How do we learn about societies and cultures gone by? Sociologists study a variety of records, often including the art of the time, to see what it can reveal. A new book, reviewed in The Guardian, opens the second level of questions: what can we discern about what the art meant and communicated to the people of its time? The book features the work of Hendrick Avercamp, who devoted his life to paining winter scenes of the outdoors. 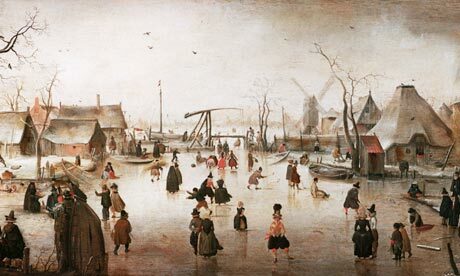 The people seem really happy – but The Guardian’s reviewer wonders how this can be: they don’t have furnaces, there are no cars so people have to walk or ride in windy carriages, polar fleece had not yet been invented. Perhaps the art is an encouragement – “let’s enjoy this” – or a way of making meaning and coping with the discomfort. There are so may other possibilities. Perhaps Avercamp was splicing together scenes that were more common – it might be preferable to stay warm through exercise than to huddle by a fireplace. In the absence of television and (for most common people) few books, the social gatherings on the ice might be more appealing. Or Avercamp might have been portraying something that would have looked to his contemporaries like an older and bygone era, a nostalgiac winter painting much as we have Norman Rockwell’s now. Breugel the Elder also painted winter fun – although he tended to include even more, and more complicated, activities. Perhaps this is a 17th century equivalent of parkas and mukluks – a way of declaring and developing an identity as a Northlander. I had never heard of Hendrick Avercamp until now, and I had never asked myself the two-tiered question: what about an artist’s contemporary culture would produce a particular theme. It’s an inviting door to walk through.